It’s interesting to reflect on the number of Canadian designed graphics that have captivated the interfaith movement around the world. Let’s look at some of them. The oldest of these, the annual Multifaith Calendar, comes from the Multifaith Action Society of Vancouver, British Columbia. It is a source of accurate dates and descriptions of over 380events, including observances from 14 world religions. There is also a summary explanation of each religion, and descriptions of the various religious calendar systems. Its popularity worldwide depends partly on its outstanding works of original art and photography, by calling for submissions of artworks on each year’s theme. The 2013 calendar focuses on nature, with the theme: The Nature of Spirit. Itis nowavailable not only in the usual print format, but also as an electronic version for organizations, businesses, and insitutions. The Golden Rule Posterwas first published in July 2000, twelve years ago. Paul McKenna of Scarboro Missions, Toronto, took about five years to ensure that the expressions of the Golden Rule from thirteen faith groups are authentic. The stunning design by Kathy Gilles, Editor of the Scarboro Missions Magazine, with the symbols of the religions radiating from the globe, added considerably to the great success of this poster, and influenced the design of other posters. Used in schools, hospitals, jails, government and other offices around the world — including the United Nations — it is now available in many languages, and has spawned many imitations. To view a larger version, order it, or access an extensive set of related teaching materials click here. The lively Animating the Golden Rule video, showing high school students making the various Golden Rule statements come alive, is now available online for free. See the Resource item below. For an article describing how the poster came about, and its deeper meaning see here. Inspired by the Golden Rule Poster, the Faith and the Common Good organization in Toronto developed the Green Rule Poster based on the paraphrase “Do unto the Earth as you would have it do unto you.” They state: “Selected from many of the world’s great religious texts and spiritual teachings, the Green Rules were chosen to demonstrate that each religion and spiritual philosophy has a long-standing tradition of ecological stewardship. Each Green Rule was also chosen to acknowledge the natural world as an essential phenomenon through which we may better come to know the divine and our oneness with it.” To view a larger version of the poster, and read more click here . More recently, the Edmonton Interfaith Centre for Education and Action created a Peace Poster as part of their peace initiative, after consultation with the creators of the Golden Rule Poster. It was designed by graphic artist Ben Shokri, and contains peace statements from twelve religious traditions. For more information about the poster and a companion book click here . Hindu festival of lights Diwali will be celebrated with a professional fireworks display in Canada’s city of London, Ontario this year, reportedly for the first time. Besides fireworks in Virginia Park, elaborate Diwali celebrations in London on November 17 will include Lakshmi puja,bhajans, a quiz on Ramayan with costumes and settings, a rangoli competition, a mithai exchange, a diya painting competition, full course dinner, music, entertainment and dancing. In addition to Hindus of India-Nepal-Bhutan-Caribbean-Sri Lanka-Canada descent, Sikhs and area non-Hindus are also expected to participate, making this event titled “Diwali Dhamaka 2012” an inclusive celebration. Srishti Canada is the organizer. Vinod Varapravan, one of the members of the organizing team, says, “We had to go through hoops to get licenses/permits/insurance from city, fire and police officials and get sponsorship to do fireworks, which is tightly regulated in Canada, for safety reasons,” adding that the purpose of the event is to restore fun and symbols back into our festivals. Otherwise our younger generations will tune off. Diwali, which falls on November 13 this year, aims at dispelling the darkness and lighting up our lives. It symbolizes the victory of good over evil. Hinduism, oldest and third largest religion of the world, has about one billion adherents and moksh (liberation) is its ultimate goal. On Oct 13, Dr. Jeffrey Wattles was honored with the Golden Rule Ambassador Award in Toronto, granted to him by Scarboro Missions and Interfaith Unity Ministries. This award recognizes the extraordinary commitment of Dr. Wattles in the realm of Golden Rule scholarship and education. Dr. Wattles, a professor of philosophy from Ohio, and author of an important book on the Golden Rule, was in Toronto recently to give a number of talks on the Golden Rule. This ambassador award was initiated by Mussie Hailu, an extraordinary golden rule and interfaith activist in Ethiopia. When members of the Interfaith Gathering at St. Thomas University, Fredericton, New Brunswick, heard about the harassment of some Jewish students at one of Fredericton’s two high schools, the group took action. 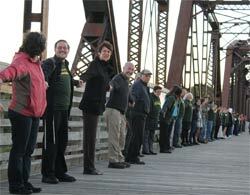 It organized a community-wide “Bridge to Unity” event to collectively express interfaith unity and fellowship. The Interfaith Gathering has been in existence since 2009 when the chaplain of St. Thomas University (Ms. Janice Ryan), two Baha’i’s (Drs. Deborah and Will van den Hoonaard), and the local Rabbi (Mr. Yosef Goldman) decided to hold weekly meetings to promote fellowship among people of diverse faiths and beliefs. Concerns that the establishment of a prayer room, requested by Muslim students, at a London, Ont., Catholic high school will water down the school’s Catholic faith are just plain wrong, says the school board’s education director. “First of all it’s a prayer room, it’s not named after a particular faith,” said Wilma de Rond, director of education for the London District Catholic School Board (LDCSB). “When a request comes from another faith, there is no request for us to provide any sort of accommodation for them that in some way impacts our faith.” ... Earlier this year about 25 students at the southwestern Ontario school, with a student body of about 1,400, submitted a request to the principal for a room for Islamic prayer during lunch period on Fridays. This is the first religious accommodation request of its kind for the board, said de Rond. Toronto’s Scarboro Missions’ movie, Animating the Golden Rule, is now available free of charge on the Internet. The DVD features students in three Toronto high schools embodying golden rule values by way of skits, artwork, interviews, music, dance & rap. The film eloquently demonstrates how character education can be engendered in young people using play, creativity and the arts. This movie is very useful for teachers and youth leaders because of its themes of youth, global citizenship, multiculturalism, ethics, diversity and the arts.